Born in 1950 in Paimpol in Britain near the sea and the sky, Alain Le Boucher, has always been passionate about astronomy. 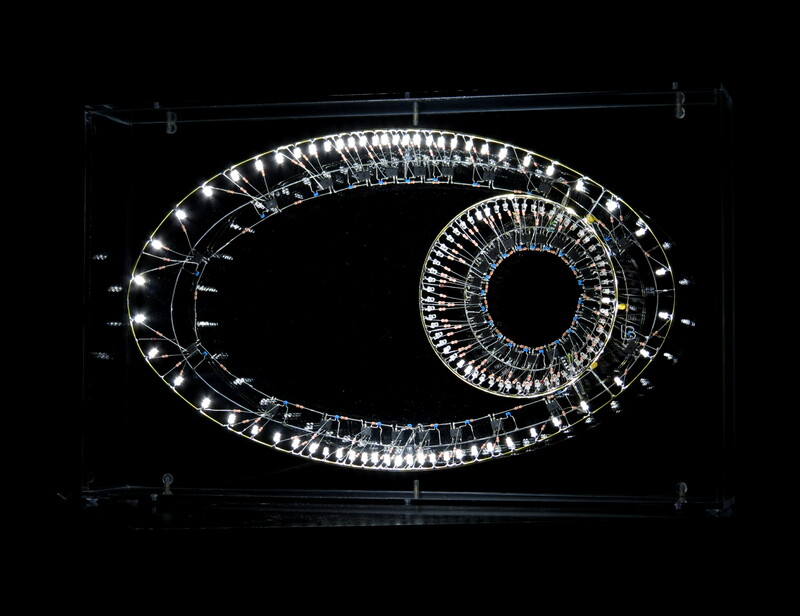 Philosopher, artist and computer scientist, Alain Le Boucher created living luminous sculptures that he named 'Luchrones' (Lux: light; Chronos: time). The 'Luchrones' of Alain Le Boucher are sculptures whose lights change according to programs he writes like music. Through a transparent construction of thin metal wires, the movements and rhythms of light transform constantly the volume and make the sculpture living. Inspired by the distant flashes of stars, Alain Le Boucher uses light as his preferred means of expression and contemplates it as a message carrier, as a puzzle to decode. By composing real luminous choreographies, he seeks to create a volume of space-time, opening thus the sculpture to the fourth dimension. Martha von Suttner - Art critic, writes : "Reenchant our time. We need to remember that Alain the Butcher considers machines and computers as poetic objects. In that respect, he follows a trend illustrated by Monet or Turner, the first ones who painted steam engines. At that time, this trend created a big scandal and was strongly criticized by the art critics. Today, there are so many surprising machines that we are not astonished anymore by any of them. Alain Le Boucher wants to fight against this everyday acceptance of the supernatural, against the "disillusionment of the World" that evoked Max Weber in 1917. It is with his sculptures - Luchrones - that he can provide us with a huge pleasure to follow the evolution of the light in its work during 3 to 10 years. Luchrones, as a usual sculpture, are three dimensional structures but one other dimension is included as well : the Time". Translated in part from the french text). The Exhibition 'Winter Light Operas' includes some mural works, some others on podiums.